I am trying to import Sketchfab 3d scans of interiors and exteriors into Unity. 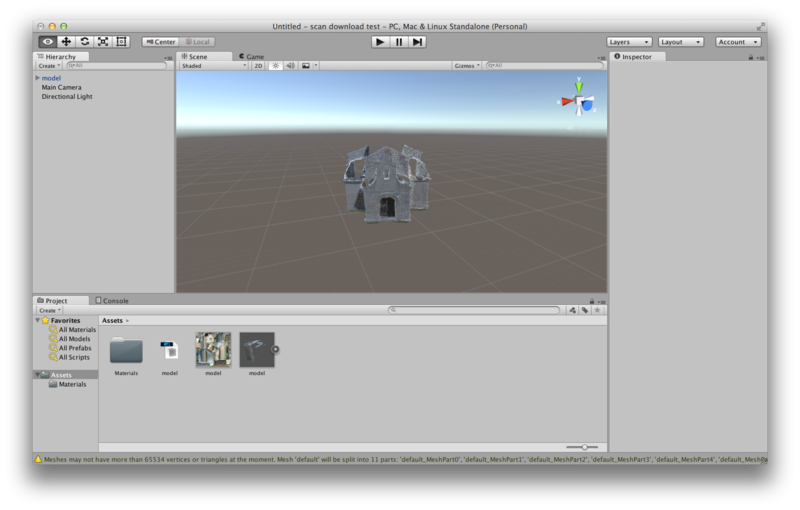 So far, I have been unable to successfully get a HQ obj into unity properly. Is there a proper workflow for this process? You downloaded a Sketchfab model? Which one? I think it takes so long because it has to split meshes at 64k polygons. I am still unable to match your results. My model seems to have incorrect normals, with missing texture triangles spread out over the model. Also, the model is only visible from the outside and dissappears when going inside and looking out. Can you take a screenshot of the model import settings in your inspector? I'm not sure what the settings are. I just drag'n'dropped the 3 files into the Assets window. If you click on your model.obj in the Assets folder, your import settings will appear in the Inspector window.